Hire-Suits have such a broad range of top-of-the-range suits available in all sizes, it is impossible not to find something perfect. Their service is also super fast! Of all the occasions that require a suit, a funeral is the one we favour least; unfortunately, it is a situation that most people will face at some point and wearing a suit is a great way to pay respects. Many of us do not consider buying a funeral suit as it is something that you do not particularly want in your wardrobe; thankfully funerals are few and far between and meaning there is no need to buy. When the time comes when a suit is required, funeral suit hire is the perfect solution, it allows you to find the ideal suit for the occasion and then return it afterwards, and this means no need to pay over the odds for an outfit that is only to be used as a one-off. What type of suit is used for a funeral? Not every type of suit is suitable for a funeral, evening and wedding wear would be inappropriate and a tuxedo would look hopelessly out of place and inconsiderate. Suitable funeral suit hire would be to opt for a lounge suit or possibly an Edwardian jacket. The lounge suit is one that is one that is ideal for many different occasions and is available in a wide range of sizes covering children and adults. Although the colours for funerals are limited to grey, charcoal and black, there is an excellent choice of fabrics available. 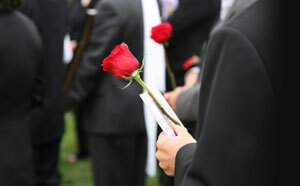 The price of funeral suit hire will often be determined by the fabric of the suit. It is possible to hire cotton or linen lounge suit for under £ 40. Fabric such as herringbone, silk and fine wool will cost more as they are regarded as higher-quality fabrics. The jacket of a lounge suit is single breasted and a choice of one, two, three or four front buttons are available. Trousers will match the style and fabric of the suit. Another option with the lounge suit will be the choice of lapels, with shawl, peaked and notched varieties offered. An Edwardian coat is slightly more elegant than the lounge suit jacket and is a three-quarter length with a more tailored look and once again, the trousers will match the jacket. You will find that Edwardian suits cost more to hire than a standard lounge suit, with prices likely to be around the £60 mark. Where can I hire a suit? The good thing about funeral suit hire is that it is readily available and there are options even if the suit is required at short notice, as it so often is in these situations. The common option is to hire from a shop. This will allow you to try suits on before you hire. Hire shops are very popular, and they can be found on most high streets. The other option is to hire online. This will allow you to choose a suit and have it delivered directly to your door and collected once it is no longer needed. This option is ideal for people that are working and have no time to visit a hire shop.